The CBI architecture  being used as the basis of GENESIS 3 (G-3) allows a single model-container to be used to describe a model spanning many levels of scale. This feature allows a user to transparently run multi-scale simulations. As will be described in further detail during the workshop “Multi-Scale Modeling in Computational Neuroscience II: Challenges and Opportunities", the CBI architecture contains a communication component to upscale and downscale numerical variables when moving across different levels of scale. These new capabilities and advances in G-3 usability also allow interfacing with many Python graphical tools (e.g. wxPython, matplotlib), potential web interfaces (e.g. Django), and other independent modules (e.g. Chemesis-3) for use in simulations that cover multiple levels of scale. Progress in developing Python interfaces to G-3 , combined with recent implementation of network and biochemical modeling capabilities in G-3 have allowed us to construct a new series of self-guided hands-on modeling tutorials. These are being introduced at the Introduction to Genesis 3 Workshop held in Luebeck, Germany 30 April – 5 May 2012 (https://www.gradschool.uni-luebeck.de/index.php?id=366). This poster provides an introduction to these new modeling capabilities, and to the new instructional material. Additions to the existing G-3 tutorials on use of the G-shell cover network creation commands and the use of the Chemesis-3 module. The rewritten version of the tutorial "Creating large networks with GENESIS" demonstrates the use of Python scripting to create cortical network models in G-3. The tutorial "Adding a GUI to G-3 simulations" shows users how to leverage the Python programming interface to construct visual tools. As an example, Figure 1 illustrates the use of the new G-3 Netview visualization application to display and replay an animation of the spreading excitation in the RSnet2 simulation that is the basis of the GENESIS network modeling tutorial. 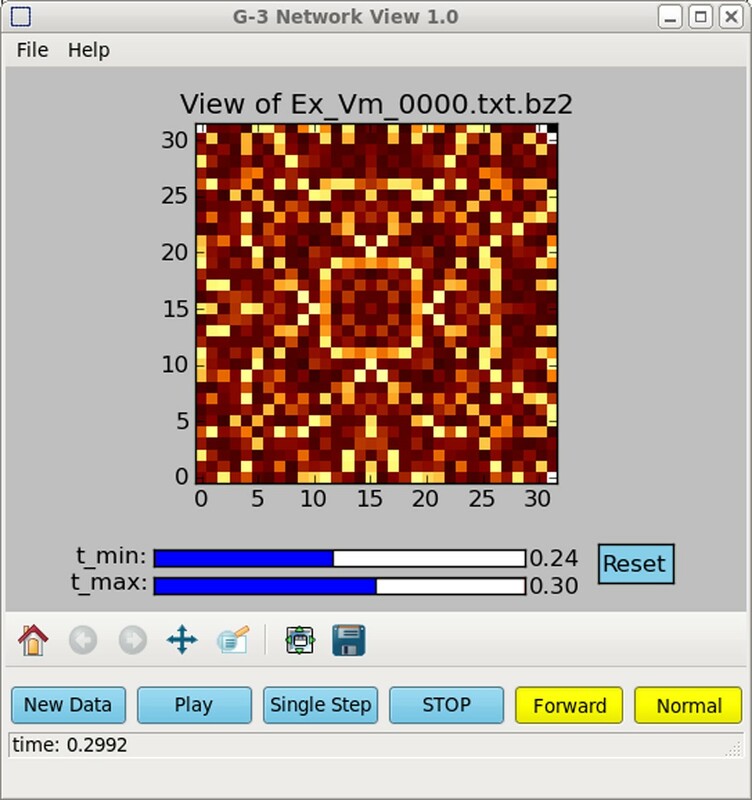 A short injection pulse applied to a 32 x 32 cell network of coupled excitatory cells starts a wave of excitation that can be replayed and examined in detail during any time window, using the G-3 Network Viewer. Armando L. Rodriguez and David Beeman are partially supported by NIH grant 3 R01 NS049288-06S1 to James M. Bower.